I made this necklace for my mother for her 80th birthday. The pendant was purchased first. 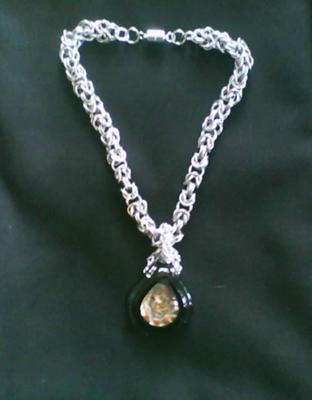 Then I decided to make the necklace. 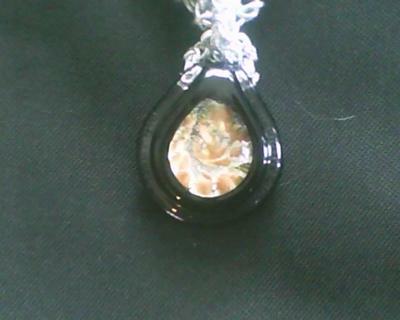 Smaller rings were used for the pendant. So far, this is my favorite chainmaille. I forgot to say thank you to Jill! Sorry. This is a message" ONLY FOR JILL WHO KNOWS HOW TO DO THE BYSANTINE" necklace, please excuse my poor spelling. I hope this will go through with out going public. If this does go public, please don't send me anything except for the information on the chain. I don't want to get into trouble with too many e-mails! I have instructions. What is you email address so I can send them to you? Can anyone send instructions on how to make a byzantine chain? I would like to make earrings, bracelet and necklace out of it.